There’s no question that online sales have been, and will continue to change the retail landscape. However, it can be hard to show exactly how this is influencing and impacting standard economic data. Sure, Census reports e-commerce sales as a share of all retail sales on a quarterly basis, but that’s simply a slowly increasing figure over time that has yet to breach 10%. Here in Oregon we have even greater data limitations, so consider this a first pass at trying to show the changes. The upshot is there has been a clear impact on employment within the retail subsectors that seem to face the most online competition. Given data availability for Oregon, these subsectors include clothing, shoe, and jewelry stores, sporting goods, hobby, book, and music stores, and department and other general merchandise stores. For now we are calling these Brick and Mortar retailers as shorthand for writing out all those different types of stores. While jobs in Brick and Mortar retailers have stopped growing in the past 18 months, even down a couple hundred, they have been more than offset by other gains related to retail. For example, employment continues to grow in e-commerce related sectors like nonstore retailers (online, mail order, etc), couriers and messengers (delivery trucks), and warehousing and storage jobs. These e-commerce jobs are up around 2,300 in the past 18 months. This transition is resulting in more jobs overall, even as the type of jobs and the nature of the work do shift. Furthermore, it is important to note that retail jobs overall continue to increase due to gains in all other retail subsectors outside the Brick and Mortar ones. Employment at car dealers is growing, following trends in car sales. Jobs are increasing at home improvement stores, grocery stores, and now OLCC licensed recreational marijuana retailers. The calls of a retail apocalypse are overblown. That said, there have been numerous closures among large, national retailers. Some of which are painful not just for the workers, but also the individual developments and downtowns that are losing their anchor tenants. Repurposing these former retail spaces is a high priority. In terms of the outlook, our office forecasts retail jobs to increase in Oregon, even with the shift toward online and some minimum wage impact. The biggest reason is that Oregon continues to see a growing population, and therefore increasing consumer demand. The old adage is retail follows the rooftops. Now, we do not expect exceptionally strong gains, somewhere around 1% per year for the next few years given the impact of these larger shifts. We also know there have been additional announcements of large distributions centers in the Willamette Valley. As such the ongoing retail shift will continue. Again this is our first effort at trying to quantify and show some of these changes. Online competition is far reaching and has influenced many different trends (e.g. travel agents), though they are hard to isolate in the data. We welcome your input and feedback! 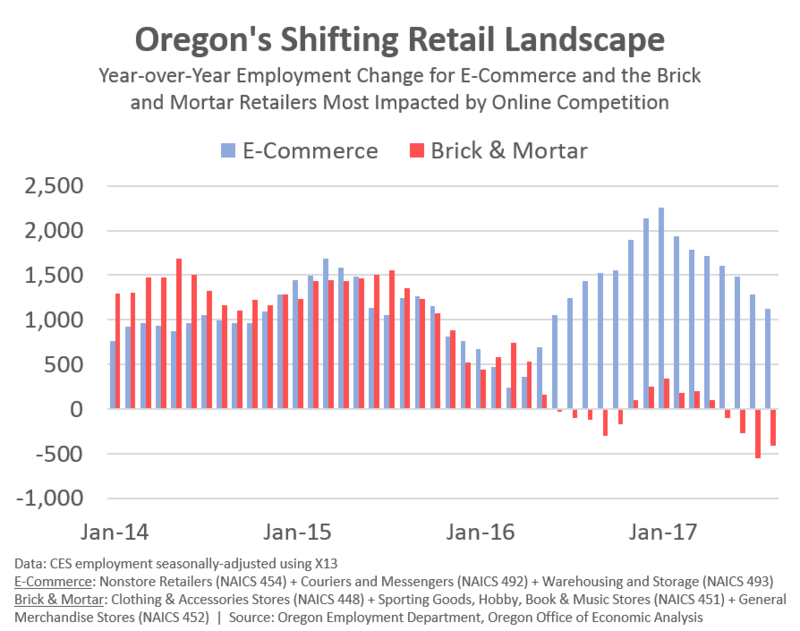 For more please see this article by Oregon Employment Department’s Ainoura Oussenbec from this summer talking about trends in the retail industry and OED’s projections.